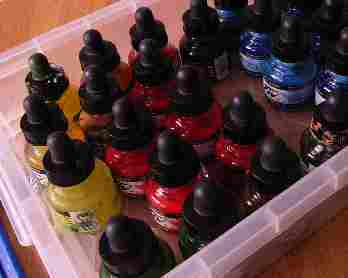 Acrylic inks are a relatively new product - and as the name suggests are ink-like in consistency. (The most fluid of the acrylics). They are available in a fantastic range of colours. They are very versatile - use with water to thin out and create washes, for example. They are a medium I love. Their fluidity means you can apply them directly without losing the intensity of color. I apply them directly as a background and then spray water over them. This creates fantastic runs and colour mixes - well worth experimenting with. You can also use them in a more painterly style - choosing colours directly from the bottle. Color mixing is also very easy. My preference is FW Inks by Daler Rowney.